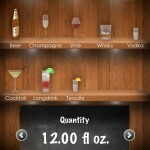 Liquor Log ($0.99) by devLUX is an app that will help you keep track of how much you drink. It's the weekend and the beginning of a new month, so this is a good time to track exactly how much you drink in a month. I mean, if you want to. 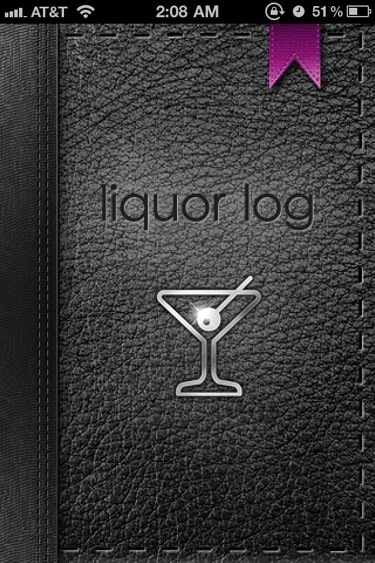 Liquor Log is a nice little app that will help you do just that. 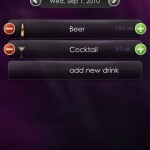 The app opens up to a blank 'Today' screen, where you see the date and 'Add new drink' button. You can go to different dates even, though it seems the only way to do so right now is one-by-one with the arrow buttons. 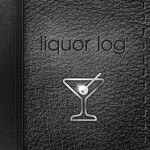 This navigating of dates is good in case you forgot to log what you drink and how much of it the night before. That is, if you can still remember. 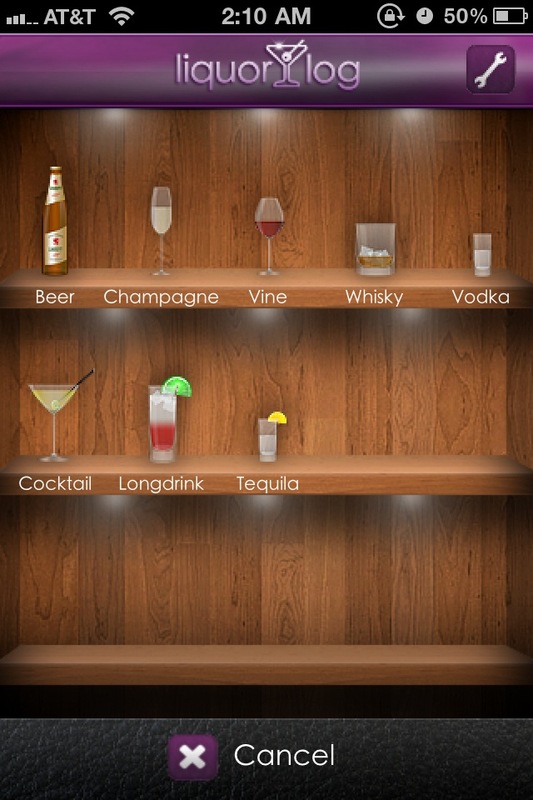 To add a new drink to your log, tap the 'Add new drink' button and then a gorgeous looking cabinet shelf screen will come up, with different drink choices (little glasses and all). 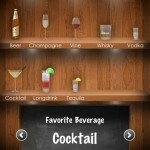 There are only 8 choices: Beer, Champagne, Wine (it has a typo in the app and is called 'Vine'), Whiskey, Vodka, Cocktail, Longdrink, and Tequila. Unfortunately, there's no way to add something new or to even customize the drink or add more specific details to it, or even control what size it was. Once it's on the log, you can adjust how many you've had by using the - and + buttons. If you have had more than that kind of drink, simply add another one in using the same process. 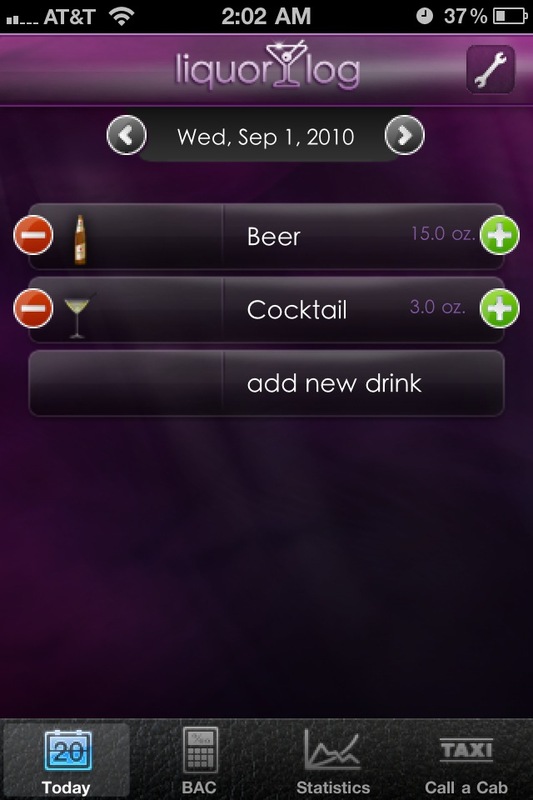 The app also allows you to input your gender, weight, and the timespan of how long you have been drinking to calculate a Blood Alcohol Level in the BAC tab. The weight and timespan are adjusted using sliders, which I have found to be pretty hard to get accurately if you can't get it to stay in the precise spot. Perhaps the best way to input this information is to let users input it in manually. But please take the warning seriously - the BAL is just an estimate and isn't 100 percent reliable. 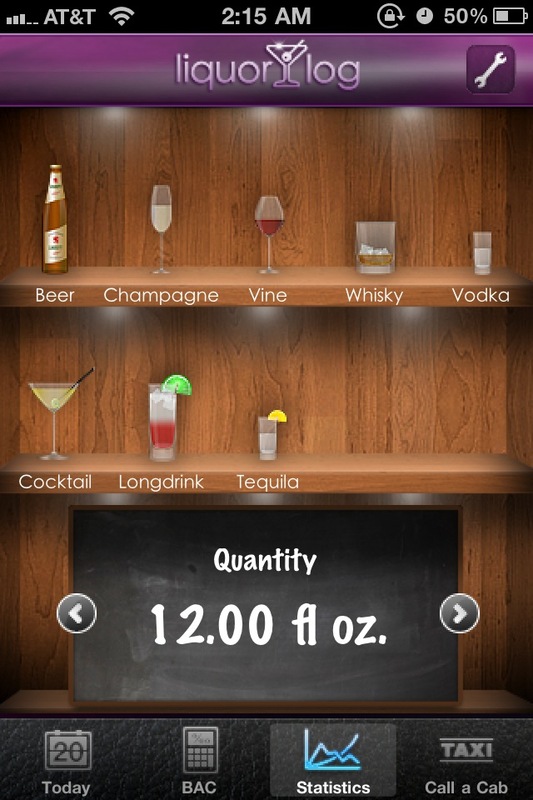 The next tab is Statistics, which lets you see at a glance how much you've had to drink so far in the month. Additionally, you can see the quantity (in fl oz. 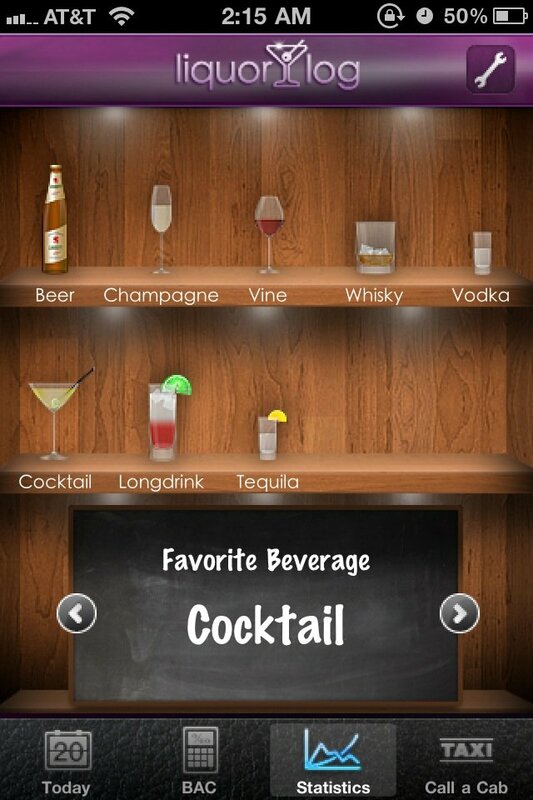 ), maximum number of drinks in one night, the average number, and what your favorite beverage is based on which you've had most [in the app]. Curious about how many of a certain type of drink you've had? No problem - just tap on a drink. Unfortunately, there's no way to go back to showing the overall data again unless you go out of that tab and come back. Just a minor annoyance, but no biggie. If you rotate the device into landscape, you get a nice little graph of what you drank in a month. If you've had too much to drink, there's the handy little 'Call a Cab' tab that will let you input a phone number for a taxi (or a designated driver friend) and immediately call with the big 'taxi' button. There is a Settings option in the app but it doesn't have much - just a toggle for Metric System and to clear all data. 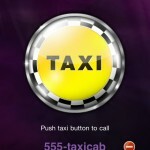 While the app is somewhat user friendly and great looking, it's lacking customization. What if you want to customize the drink? What if the size of what you're drinking is smaller or larger than the default? For example, one beer defaults to 15 fl oz, with no way to decrease or increase the amount. The sliders in the BAC tab need to be gotten rid of and replaced with manual input as well - it's just more precise and easier for users. 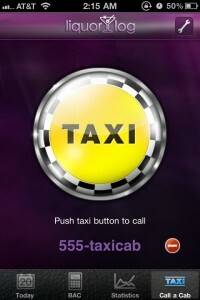 The design of the app is great looking, but needs to be optimized for iPhone 4 Retina display. 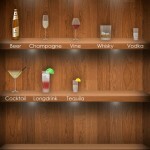 Then it would probably be like looking at a real pantry with mini-drinks on your screen. It's definitely got potential, but needs some work. 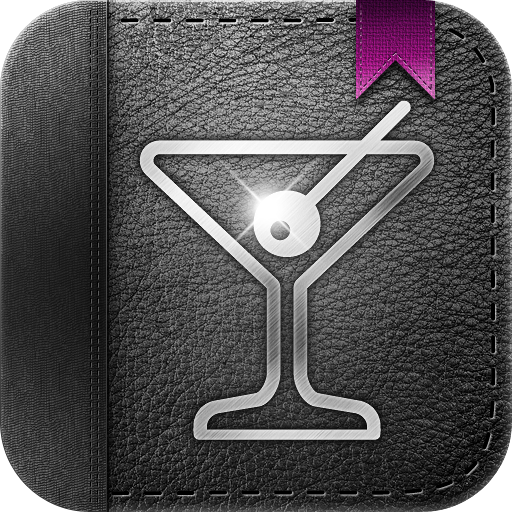 If you're interested in tracking your drinking habits, then keep your eye on this one. It would help when you can actually remember what you drank. You know, when you're not blacked out and all that good stuff.